The SlimKool Series indoor/outdoor Air Conditioners can be mounted on the exterior of shallow electrical enclosures common in the industry today. The Kooltronic SlimKool Series consists of compact models with a standard width of 11.75 inches, and a standard depth of 15.1 inches, with heights ranging from 28 to 43 inches. These models offer capacities from 4,000 to 11,000 BTU/H, and can operate in ambient temperatures between -20 and 131°F. With epoxy-coated coils and tubing, the closed-loop cooling system of the SlimKool Series offers added security by providing an operating environment safe from harsh ambient conditions. The SlimKool Series models are equipped with a programmable thermostat as standard on all models, allowing more accurate and versatile performance and monitoring capabilities. The SlimKool Series models are constructed of 18 gauge (or heavier) galvanized steel, and painted with a polyester powder coating. These units are available in 115, 230 and 480 Volt, and are rated NEMA 12, 3R and 4. NEMA 4X protection is offered with an optional stainless steel shell. From indoor washdown to outdoor corrosive environments, this versatility makes the SlimKool Series a perfect choice for virtually every application. 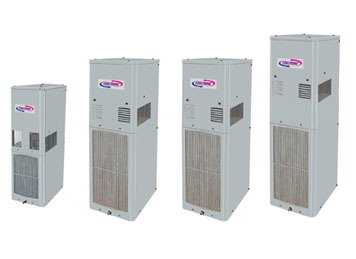 KOOLTRONIC also designs and manufactures a variety of air conditioners to meet unique specifications. We invite your inquiries about our modification and custom-design capabilities. All models are UL/CUL Listed. The enclosure interior airflow system is isolated from the ambient airflow or waterflow system. No ambient air can invade the cool, dehumidified sensitive component compartment. Protects the compressor from possible damage due to harmful short cycling, (frequent starting) where temperature controls enable the compressor to restart frequently or after a power interruption. These conditions could be due to low or fluctuating heat loads within the electrical enclosure or a power failure. The Compressor Short Cycle Protector will prevent the compressor from starting when it has been shut off for less than several minutes or the power was interrupted. By limiting the number of compressor starts per hour, the life of the compressor is prolonged. It is recommended where installations are subject to solar gain and or changes in the enclosure internal load due to the degree of usage of the equipment being cooled. It is also recommended where higher capacity units are specified in anticipation of the future addition of heat producing equipment being added to the enclosure. Condenser and Evaporator Coils in the Guardian Series are Epoxy-Coated. This coating will withstand 1000 hours of salt spray per the ASTM B 117 test method. Also see Stainless Steel Shell, or Integrity NEMA 4/4X Air Conditioners. NOTE: Severe operational environments such as waste water treatment and salt spray are likely to cause corrosion failure over a period of time regardless of coating. Warranty: Corrosive conditions may affect the warranty coverage. Consult factory for warranty limitations in corrosive environments. NOTE: For additional corrosion protection options, contact factory. This protection increases reliability in hostile environments. NOTE: Severe operational environments such as waste water treatment and salt spray are likely to cause corrosion failure over a period of time regardless of coating. Warranty: Corrosive conditions may affect the warranty coverage. Consult factory for warranty limitations in corrosive environments. NOTE: For additional corrosion protection options, contact factory. All SlimKool Series units are fully gasketed for tight, leakproof installation, in compliance with the NEMA Type 12, 3R & 4 Enclosure Ratings. All SlimKool Series models are equipped with a programmable thermostat, allowing more accurate and versatile performance features. All SlimKool Series units have a programmable temperature alarm to alert if early action is required. For applications in corrosive or other hostile environments such as those requiring Internal Corrosion Resistant Coatings, especially where chemical/moisture combinations are present.